In this article, you will learn how to choose the best crate for your German Shepherd. You will see the 10 best crates for common uses. Whether you need a crate for your home, for car travel, for airline travel, or for your backyard, you’ve come to the right place. We’ve showcased a variety of styles and structures. We hope you find a crate to make your German Shepherd happy and comfortable! The crates we’ve chosen for indoor use are suitable for both puppy German Shepherds as well as adult German Shepherds. As you’ll see in the buying guide, you will need to measure your dog for the properly-sized crate as he grows. First up, we chose the MidWest Homes for Pets Dog Crate with accompanying cover. This wire crate offers incredible versatility with an adjustable divider. This means you can purchase a crate bigger than what is necessary for your puppy, insert the divider to create a suitable size crate, and adjust as necessary as your puppy grows. You’ll save money by purchasing only one crate. Additionally, you can easily place a comfy bed or mat in this crate for your puppy. Just find a bed in accordance with the crate measurements and you’re done! Your German Shepherd will have a cozy space of his own for naps and playtime. 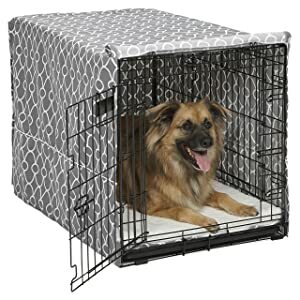 To make the crate feel even more den-like, we recommend the MidWest Homes for Pets Dog Crate Cover. As ancestors of wolves, dogs like an enclosed space similar to an underground den. Did you ever notice that your dog likes to sleep in a corner or with their back against a wall? Dogs position themselves this way so they can easily watch for predators in front of them without having to worry about something sneaking up from behind. Your German Shepherd doesn’t really need to watch for predators in your home, but the instinct is still in their brain. Therefore, this crate cover protects their back and their sides. They can rest easy with a watchful eye on the doorway of the crate. We chose this dog crate because it’s useful for both indoor use as well as car travel. The cloth structure fits in the back seat of your vehicle or the hatchback. The carrying handle makes it easy to move the crate from home to vehicle. The foldable build makes it easy to store when not in use, but you can train your German Shepherd to enjoy time in this crate while at home. 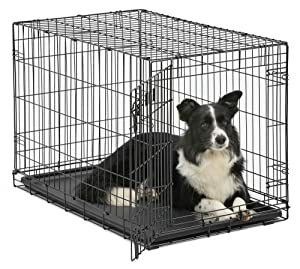 With a lot of positive reviews on Amazon, this crate is an affordable solution to your German Shepherd’s needs. 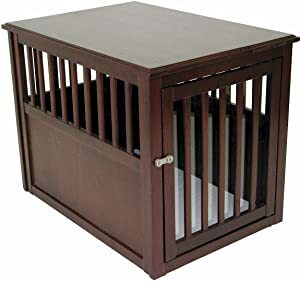 However, without a divider in this crate, you will need to purchase multiple crates to accommodate your growing puppy. Check the buying guide later in this article to correctly measure your German Shepherd for a suitable crate. This wood crate will make a bold statement in your home. Instead of an eyesore in your living space, you will have an elegant, multi-use piece of furniture. Place this beauty beside your couch or recliner so your German Shepherd can relax near you while you relax in your favorite spot. We chose this crate for its high durability. However, judging by reviews, we do not recommend this crate for heavy-chewers with crate anxiety. If you’ve properly crate trained your German Shepherd, you have nothing to worry about. But if your pooch happens to be an escape artist, this may not be the crate for him. Dogs may chew through the wood rails and gain freedom. We chose the Guardian Gear ProSelect Empire Dog Cage for the high-strung German Shepherds who need a crate to match their power. This crate is made of 20-gauge steel and reinforced with half-inch diameter 20-gauge steel tubes. Your power chewer will not be able to break through this crate! And if your German Shepherd has crate anxiety, the open-grate style may not make him feel trapped in a cage. The tray under the floor grate catches any fur, food crumbs, or whatever may fall off your pooch, and removes for easy cleanup. And the removable casters allow for easy movability throughout your home. They lock in place, too, so your pup doesn’t go rolling away. Families love to travel with their pets. They are part of the family, after all! If you’re looking to travel with your German Shepherd, either by car or airplane, we’ve chosen a few of the best crates for your adventures. The Petmate Dog Kennel works perfectly for traveling with your small German Shepherd puppy. Since it’s only available in a 19” size and a 24” size, it will be suitable only when your puppy is very young. But if you travel often or have multiple young pups in your house, this could be the ideal option. The handle makes carrying your pooch quite easy while the top door allows you to give him treats or toys with ease. Be careful when traveling by airplane with a small puppy. You’ll want to make sure you can keep your German Shepherd puppy under your seat where you can ensure his safety and happiness. The AmazonBasics Pet Kennel is another strong option for traveling with puppy German Shepherds. Similarly, this crate has two doors, but with this option the top is plastic instead of wire. This plastic top gives your puppy more of a den-like feel, which makes him feel safer. The top door also opens from both the left side and the right side. All you have to do is pull a latch for easy access. Again, this crate is only available in two sizes: 19 inches and 23 inches. This means it is suitable for your German Shepherd only when he is a small puppy. Be sure to keep track of your puppy’s growth so he doesn’t get cramped in this crate. 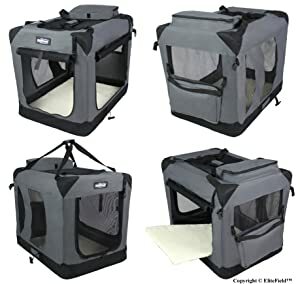 We chose this heavy duty Dog Carrier for airline travel because owners of this carrier report very few issues between their airlines and this carrier. Each airline has different regulations, so check what type of carrier you need before you purchase one. But this carrier proves to be safe and comfortable for German Shepherds of any size. The Petmate Sky Kennel is available in six different sizes to fit your dog at any age. A Life Animal sticker and food and water bowls are included with the carrier. Additionally, the carrier is proudly made in the USA! 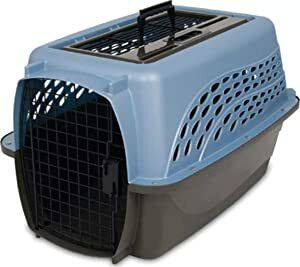 Remember, a carrier should be 3 to 4 inches taller and longer than your dog so he can easily sit up, lay down, and turn around while on a flight. This Soft-Sided Pet Travel Carrier is a secure option for younger German Shepherds who travel with their handlers. 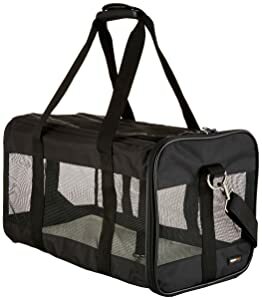 The carrier holds up to 22 pounds, so you’ll be able to carry your puppy through an airport or keep him comfy on a car ride. The ventilated sides of the carrier allow your German Shepherd puppy to see all his surroundings while getting ample airflow. This dog carrier is well-reviewed, simple, and easy to use. The shoulder strap sits comfortably on your shoulder. The firm bottom prevents your puppy from sagging. Overall, this carrier is a great option for your travels. Your German Shepherd may want to spend some free time outside once in a while. If you don’t have a fenced-in yard, a kennel may be a good investment. Here, we’ll give you the best option we found in outdoor dog kennels suitable for German Shepherds. 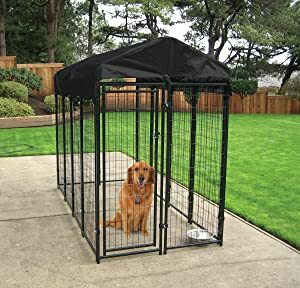 The Lucky Dog Outdoor Kennel is useful for giving your German Shepherd outdoor time without worrying about him running away. The cover offers great protection from sun and rain, but be sure to keep your dog indoors during severe weather. With thick coats, German Shepherds can overheat quickly and need to be inside in air conditioning. Definitely do not leave your German Shepherd outside in harsh weather while you’re not home. Make sure your German Shepherd has fresh, cold water while he is in his kennel. Water is important at all times. Give him a large bowl and maybe throw some ice cubes in it! When purchasing a crate for your German Shepherd, it is incredibly important to know what to look for in terms of size and features. We are happy to provide you a guideline of how to find the best crate for your dog. First, you want to take some measurements of your dog. Have your dog stand up straight and tall. You may need a second person to assist in measuring. Measure from the tip of your German Shepherd’s nose to the end of his rump. This is his total length. Next, have your dog remain standing and measure from the top of his head to the floor. You can also have your German Shepherd sit for this measurement. The total height should be about the same whether he is sitting or standing. You can do this process as often as needed as your German Shepherd grows from a puppy to an adult dog. When you notice he is getting too big for his current crate, measure his height and length again. Continue onto the next step in this buying guide to know what size crate you need. Typically, for a full-grown German Shepherd, a 48” crate is most comfortable. It may seem enormous, but it allows your German Shepherd to comfortably stand up, sit down, lay down, and turn around with ease. Once you have the height and length measurements of your German Shepherd, add 3 or 4 inches to each measurement. This is the minimum size crate you need. Let’s say your German Shepherd measures 44 inches in length and 32 inches in height. A crate that is 48 inches in length and 35 inches in height is suitable for your pooch. If you find a crate a few inches bigger than your minimum measurements, that’s not a problem! Again, you want your German Shepherd to have enough room to walk in, turn around, sit down, or lie down without being cramped. However, you do not want to give your puppy German Shepherd a crate that is too big. They may have an accident at one end of the crate and sleep at the other end. If there is only enough room to lie down, they will not have an accident. After your puppy is housebroken, you won’t have to worry about these accidents anymore. If you’re buying from a brick-and-mortar store, check the crate for loose bolts and screws. Ensure all parts are sturdy and secure. Check for wires that may be sticking out and could catch on your dog’s skin or collar. If the crate is rickety and loose, it is not strong enough for your German Shepherd. If you’re buying online, read reviews before purchasing. People are very honest and will tell you exactly what they think of their crate. You may even get to see some pictures of what the crate looks life and what size dog looks comfortable in it. 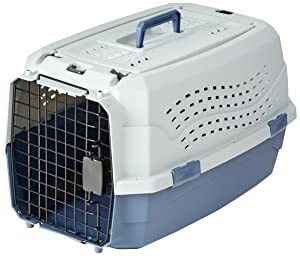 As for the structure of the crate, a plastic crate that is almost completely enclosed could make your German Shepherd feel like he is in a den. As ancestors of wolves, German Shepherds love sleeping in enclosed areas that feel like a wolf den that covers their back and sides. It allows them to watch for predators while they sleep. Like we said earlier, your German Shepherd won’t have to watch for predators in your home, but the instinct is still in their brain. If you find a wire crate that fits your home and your budget, you can purchase a cloth cover that encloses the sides and back to resemble a den. Cloth crates are great choices for dogs who travel often. If your German Shepherd uses the cloth crate in the home, he will feel more comfortable in the car because he is in his familiar den space. Using the cloth crate for both home and car could reduce any car anxiety. We recommend crate training your German Shepherd puppy right away so he doesn’t get crate anxiety. If you have a German Shepherd with crate anxiety, you should do your best to crate train him. To do so, you may need a 20-gauge steel crate like the one we listed earlier. 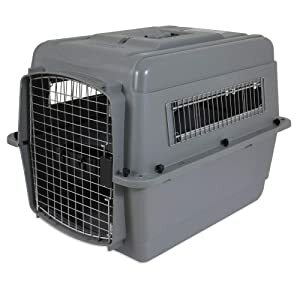 When purchasing a crate for airline travel, check with your airline first about their dog crate regulations. 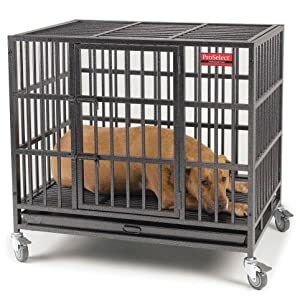 Purchasing a crate that follows all their regulations will reduce the headaches of travel and ensure your dog travels with you safely and comfortably. Each airline has different regulations, so do your research carefully. Now that you have a solid understanding of crates for German Shepherds, get out there and find one! Talk to people who have large dog crates and take their recommendations, too. The more information you have – the better. If you still have questions, please leave and comment and we will be happy to help! Previous Post: « Feeding Your Goldendoodle: What’s the Best Choice?